If you, like millions of other Netflix viewers, spent part of the holiday season binge watching Marie Kondo and have now “tidied” up your home, you may be sitting on piles and piles of unwanted, non-joy-sparking stuff and wondering “what now?” Or maybe even wondering, “how did I get here?” And after all of that work (she estimates most people will spend up to six weeks following her tidying method), how can you avoid getting back where you started? As you might imagine, I have some thoughts about this. 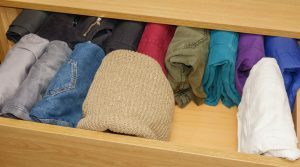 First, what I’ve realized after being a professional organizer for 14 years, is that we all (myself included!) have way too much stuff. And honestly, stuff is so cheap, and so easy to come by, and so deliverable to our doors (thank you, Amazon) that we buy stuff without even thinking about it. And this is a problem. We all must begin to be more mindful before we purchase. Perhaps the question to ask before we type in our credit card number is: Will this really spark joy? Do I have room for this in my house? Is this worth my hard earned money? Will I just be taking this to the thrift shop in 3 months? Second, we create far too much trash in our world. It’s estimated that we (humans, that is) will send over 2 billion tons of trash to the landfill this year. It’s almost unfathomable how much trash that is. Obviously, we cannot continue on this path or we’re all going to be building our own personal landfill in our yards. No thanks! Consider ways to throw away less stuff—and maybe start by buying less in the first place. We can no longer assume we can recycle our way out of our mess on our lovely little planet. Last year, China sparked a worldwide crisis when they refused to accept our mixed-use paper due to contamination. We simply cannot keep consuming goods, tossing the packaging in our big blue bins, and going on our merry way, guilt free. This is not an option. How can you limit your packaging, your plastic use, and your paper use this year? We have to get better at reusing and repairing things and not just thinking we can replace everything because it’s cheap and easy. Learn to sew and mend, find a good cobbler, consider your iPhone 6S good enough, and stop feeling the need to replace things so quickly. It’s not sustainable. Finally, the only way we save ourselves the time and energy of KonMari’ing our homes each year is to minimize what we bring in in the first place. Don’t get me wrong…I’m happy to take your money to come in and help you downsize, declutter, and live with less (seriously, call me!). But in the end, we’re all in this together. And for us to truly manage our footprint, we have to get used to simplifying, saying no to impulse and cheap purchases, and accept that we all, truly have enough. Keep neat in 2019, and hopefully, this will be your tidiest year yet!